Last year, EXPO 2017 topped the news in Kazakhstan; this year, the young country has an equally important event: the 20th anniversary of its capital city, Astana. Much attention has been drawn to the Kazakh capital in recent years, with Kazakhstan rapidly rising on the global stage. Once an unknown city in the middle of the vast Kazakh steppes, Astana is now the country’s vibrant and dynamic centre. Home to a little over 1 million people, its flashy, futuristic buildings and unique charm are steadily earning it international recognition. Kazakh President Nursultan Nazarbayev was behind the idea to relocate the country’s capital from Almaty, the nation’s largest city, rich in history and culture, to a minor town 1,200 kilometres north in an area called Akmola. Government officials had little enthusiasm for moving from warm, sunny Almaty to a place known for its windy, freezing winters. But building a brand-new capital from scratch embodied the young nation’s aspirations, as well as its desire to break from the remnants of its Soviet past. 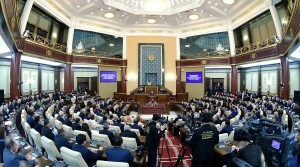 The Supreme Council of Kazakhstan, as the national parliament was known then, approved the decision to move the capital from Almaty to what was then called Akmola on July 6, 1994. July 6 was later made a holiday: Astana Day. The decree on the move was signed in October 1997. 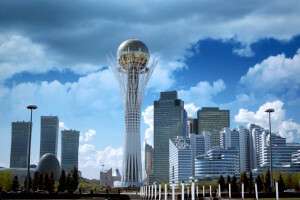 Half a year later, in May 1998, the city got its new name, Astana, which means ‘capital’ in Kazakh, and in June 1998, the country presented its new political centre to the international community. “In 20 years, we have managed to build a new, beautiful city in the heart of the Great Steppe and present it to the whole world. Astana has become the pride of our nation and this is, of course, the result of efforts made by the city administration, construction workers and architects. We are celebrating the 20th anniversary of Astana this year, and it is necessary to demonstrate to our guests its beauty, attractiveness and high standards of living achieved over the last two decades,” Nazarbayev recently told a meeting devoted to Astana’s development and its birthday. Several factors underpinned the decision to bring Kazakhstan’s government to Astana. Almaty, for all its charm, also sits in a seismically active area. The mountain-ringed city’s rapid population growth had also limited opportunities for the expansion the growing nation knew was coming – expansion that would further stress Almaty’s ecology. 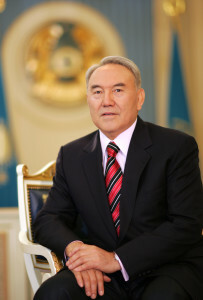 Nazarbayev’s vision to reflect the country’s aspirations and its unique position between East and West with an undeniably Eurasian style was made real while building Astana. Locals often juxtapose the city’s old section on the right bank of the Yessil River to the new part on the left. On the right bank is history, and predominantly Soviet-style architecture; on the left, modern glass buildings of assorted styles cast their shadows on the streets. The new capital has enticed people from different parts of Kazakhstan to move there in search for opportunities, of which they found many. The population more than tripled, from then 290,000 to 1,026,181 as of November 2017. Now, the Kazakh capital spans more than 700 square kilometres and is set to grow further, boasting high-rise buildings and residential complexes on the skyline. The city’s major sights include Baiterek Tower, designed by Nazarbayev and among the first symbolic buildings built in Astana, the sea green National Museum, the Kazakh Yeli monument, the Museum of Modern Art, the Museum of Military History and the Astana Opera theatre. Hazret Sultan, the largest mosque in Central Asia; the brand-new mosque, The Flower of Allah; the Cathedral of the Assumption; the Roman Catholic Cathedral of the Archdiocese of the Blessed Virgin Mary; and the synagogue Bate Rachel-Habad Lubavitch, as well as other religious constructions, also reflect the city’s diverse and beautiful architecture and people. Construction is unceasing in Astana and has ramped up as the city hosted some major events over recent years, including last year’s expo. Astana’s transition from a small provincial town to a dynamic and rapidly growing capital city is a matter of immense pride for the young nation. Today, it is a major political, administrative, business and cultural centre of the country that gets the lion’s share of the national budget compared to other cities. Over 20 years, the city’s gross regional product grew by almost 190 times, reaching approximately five trillion tenge (US$15.5 billion), and revenue contributed to the national budget rose 80 times from 13 billion (US$40 million) in 1997 to 1 trillion tenge (US$3.1 billion) in 2017. The annual volume of investment in fixed assets totalled roughly 8 trillion tenge (US$47 billion) over the last 20 years. High-level events have spurred the city’s growth and facilitated global recognition. Especially significant for Kazakhstan and Astana was 2010, when the country chaired the Organization for Security and Cooperation in Europe and Astana hosted the OSCE summit, first since 1999 when it had been held in Istanbul, and gathering leaders of 56 participating states. 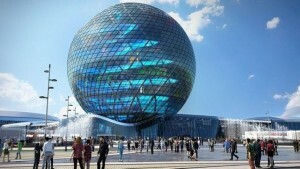 Astana’s rise on the international arena gained momentum when the city was chosen to host EXPO 2017 with the theme of future energy. 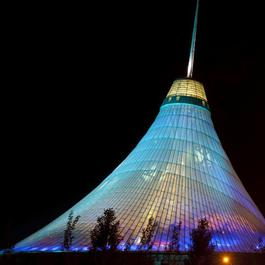 Though the money spent organizing the exhibition that ran last summer raised eyebrows among many, the expo gave a significant boost to Astana’s development and promotion. Officials said more than 4 million people visited the expo. At the same time, the city continues to embody Kazakhstan’s efforts to stabilize its neighbours near and far, including Syria and Afghanistan. This May witnessed the ninth round of the Astana Process talks, which supplement the United Nations-brokered Geneva peace process and seek an end to the seven-year conflict in Syria. They say that it is people that make cities great, and it is difficult to disagree. In Astana, generations have changed, but the city continues to grow. The relocation of the capital was a surprise to many residents of what was then Akmola. Their fate changed the moment Akmola was designated the new capital, says human resources expert and coach Gulzi Nabi, who was born and raised in then Tselinograd. “I remember when I was 12 years old, I was walking along Lenin Street, which is now Abai Street, in Tselinograd… and I was thinking how great it would be to live in a capital city. The most interesting is that life gave us a big surprise when Tselinograd’s destiny was abruptly changed and we all, provincial town residents, became the residents of a capital,” Nabi, 53, recalled. It was an uneasy process to accept, she said. “Everything went so unexpectedly. The relocation of government officials and people from other regions of the country to the city became ambiguous, as people differed in their mentality, culture and even habits,” she said. Though the flow of people from different regions was not an easy process to cope with at first, learning from every region has been a precious opportunity. “Astana is an extraordinary city, because not every person can understand the personality of the city. When the capital was born, it was like a child, the city has its own special character,” said Nabi. “My former classmates that now live in Israel, the U.S., Germany, Russia – they come here, and they are very surprised, because it is hard to believe what you see, how Astana changed and what Astana embodies now,” she noted. The city surprises first-time visitors. Marc Goldmann from Germany, currently living in Astana, praised the city’s architecture in an interview with EdgeKz. “When I first came here, I really liked the city. It is very modern, a lot of beautiful architecture, especially the expo area,” said Goldmann. “It is an achievement in itself, what Astana has achieved so far. It is quite astonishing, equally as astonishing as what Kazakhstan has achieved over the last 25 years,” he said. 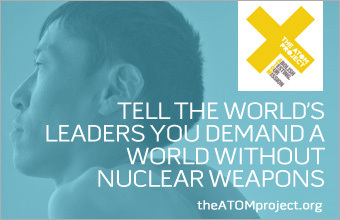 “There is one thing missing (in Astana). In Almaty, you have life and soul. Town is living, people are going on the streets, there is a lot of art, fashion, music going on, all the cultural life, very important for many foreigners,” he noted. 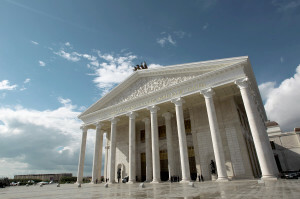 With several dozens of cultural events scheduled throughout the celebratory year, and the regular theatre season at Astana Opera and other capital theatres featuring some of the top international performances, Astana, however, is quickly turning into a major cultural centre. The “soul” argument is a bit more difficult to counter though, as Astana’s famous cold and long winters do keep people mostly indoor. That, however, can also change eventually with the new developments to be launched this year, such as the new Botanic Garden and a number of newly built or revamped parks.